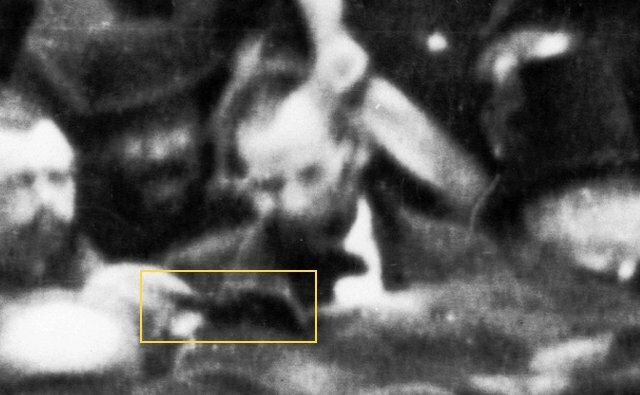 In 1952 Josephine Cobb discovered the image of Abraham Lincoln seated on the speakers’ platform at Gettysburg within a photograph taken on November 19, 1863. That photo is attributed to David Bachrach by William A. Frassanito (the “Bachrach photo”). For some time I have pondered whether Lincoln is holding an object in his right hand on the platform in the Bachrach photo — explaining why he is seen earnestly peering downwards in the direction of that object which is partially obscured by spectators’ hats in the foreground (see the object boxed in yellow, below). What can be seen of the object suggests that it moved during the exposure as some blurring is noticeable above it (see below). Could it be that Lincoln was captured reviewing his written speech — which several observers claim he removed from his coat pocket and glanced at during one point late in Everett’s oration? The object looks like it was folded — possibly even tri-folded. Might the object be a dark leather breast billfold or tri-fold inside of which rested the paper on which his address was written? Or, rather than a long secretary’s breast coat wallet, is it the very paper on which the address was notated? The likelihood that the object is the paper on which the Gettysburg Address was written is diminished by the fact that (1) it is very dark and rigid looking and (2) both the so-called Nicolay copy — thought by most scholars to constitute the oration copy held by Lincoln on the speakers’ platform — and the Hay copy exhibit horizontal and not vertical folds on both of their two pages. Is Lincoln wearing oh-so-hard-to-see steel framed glasses in the Bachrach photo? Pay careful attention to the left side of his face and the temple arm of his reading glasses which appears to be running from his left ear to his left eye as well as the hint of reflective material above each of his eyes. A portion of the glasses’ end piece on the right side of his face also may visible framed by his dark hair (see detail below which has been darkened to better reveal Lincoln’s spectacles). I also have wondered for what reason Bachrach chose to time this photograph in order to illustrate Lincoln looking downward rather than facing out at the crowd or even towards the keynote speaker — Edward Everett — who then was standing to his left? If you believe that Bachrach only desired a generic shot of the speakers’ platform, then the timing of this photograph didn’t matter in that the behavior and appearance of Lincoln and others on the rostrum would have been immaterial. 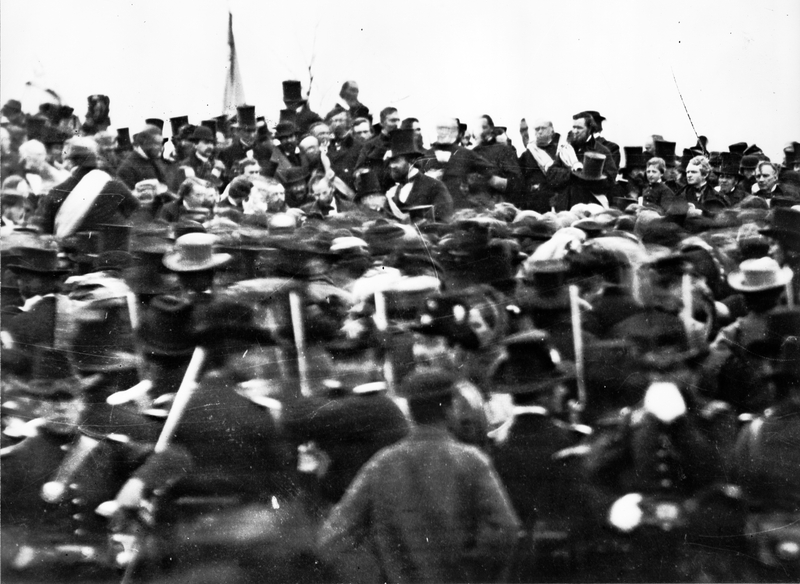 But if Bachrach was trying to capture a photograph with a compelling view of Lincoln, then I have to believe that he chose this particular moment because Lincoln could be seen holding the actual “reading copy” of his Gettysburg Address for what may have been a final inspection some time prior to his oration. Many years after 1863, Bachrach wrote that “the negatives, 8 x 10, [taken at Gettysburg] were of no real interest, I then thought, and … [they were left] for the woodcut artist.” Because he had produced a very fine generic crowd scene at the Gettysburg dedication ceremony, Bachrach’s dismissive contemporaneous assessment of that scene tells us that he had wanted something more than an image of a throng of spectators gathered around a raised platform. Rather, his account demonstrates that he must have hoped to capture a distinctive image of Lincoln and possibly other dignitaries on the elevated platform, such as Everett, but deemed his effort a failure. Therefore, it is not a reach in logic to conclude that, notwithstanding his distance from the rostrum, Bachrach intentionally timed his view with the purpose in mind of creating a glass plate image of Lincoln holding and reviewing his written dedicatory address while Everett still was standing and orating his lengthy keynote speech. 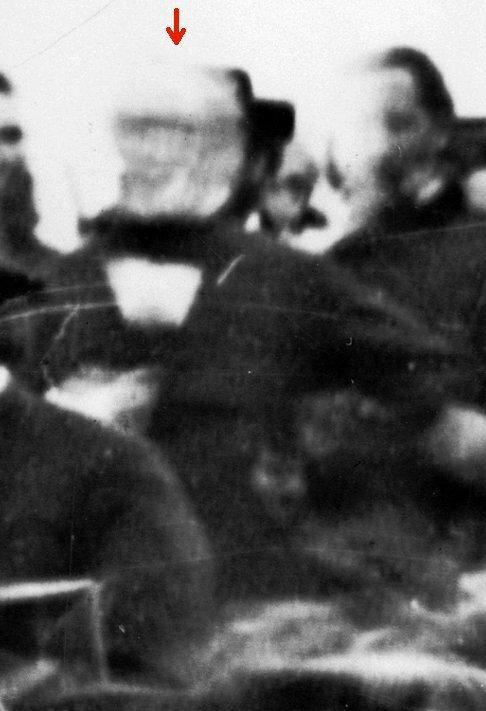 Unfortunately, the image of Everett’s highly blurred face which Bachrach captured proved even less satisfactory than Lincoln’s (see below). What do you think? What do you see in these images? Is Lincoln holding something and eyeballing it through his reading glasses or is this apparent object merely a portion of the lapel of his frock coat? The arguments against the dark object constituting part of his overcoat include that: it is much larger and darker than any other portion of his coat (including the visible coat lapels); the same rectangular area of darkness cannot be seen on the opposite side of his coat lapel; a coat lapel would exhibit softer, more rounded lines as opposed to the parallelogram-like lines and angles framing the object; only the dark object — and no other portion of Lincoln’s frock coat — moved during the several second exposure time of the photograph; and a portion of the object appears to obscure some of Lincoln’s tie. 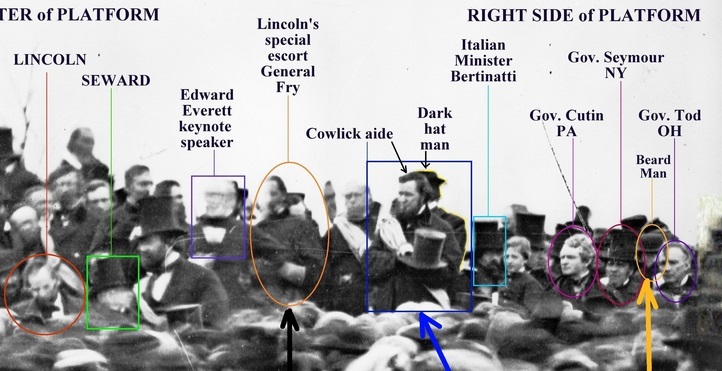 Also, the fact that the left portion (from the viewer’s perspective) of the dark object fronts a lighter-colored top hat probably resulted from the hat being held by the man seated nearest to Lincoln’s right — his personal secretary John Nicolay. This means that the dark object was held away from Lincoln’s torso at a sufficient distance to create such an effect. 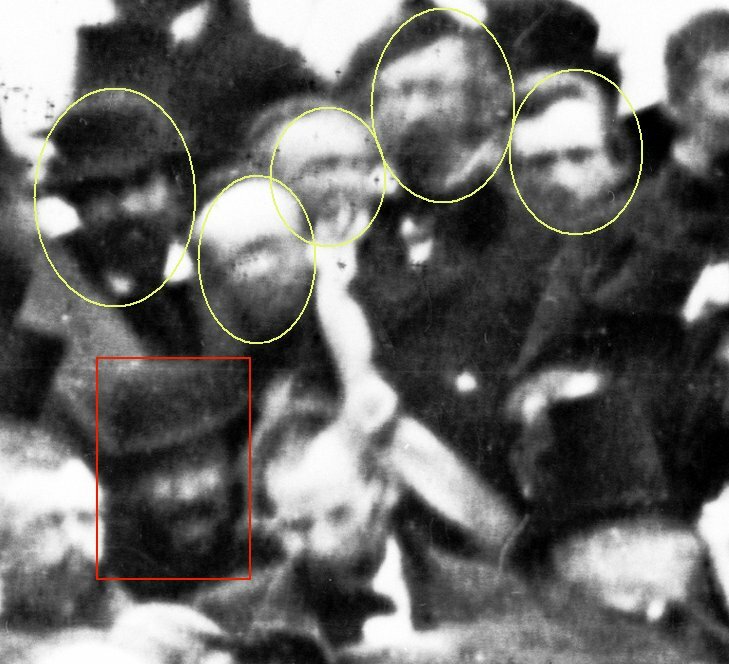 If the left portion of the dark object fronting the lighter-colored hat was part of Lincoln’s coat lapel, it would not be framed by someone’s hat in the background. Instead, it would be framed by the rest of Lincoln’s frock coat. We are reminded by these image details that historical evidence can be buried deep within old photographs. Clearly, Bachrach, like fellow photographer Alexander Gardner, did more than try to obtain generic crowd shots at the Gettysburg dedication ceremony. A careful study of the surviving photographs — combined with a critical review of the written record — can reveal to us the intentions of the photographers who were present in Gettysburg on November 19, 1863. For example, the man crouched down and peering over Lincoln’s right shoulder in the Bachrach photo is Wayne MacVeagh, then a District Attorney for Chester County, PA and a Republican party power broker in Pennsylvania (see him boxed in red in cropped detail, below). Accounts of several people, including Oho Governor Tod, the Canadian foreign minister William McDougall, John Nicolay (one of Lincoln’s personal secretaries), Sergeant James Rebert (who guarded Lincoln’s room on the morning of the 19th), and several others support the contention that Lincoln visited a portion of the battlefield very early on the morning of November 19th, was deeply moved by the experience, and then further modified a portion of his Address shortly before he mounted the horse upon which he rode in the procession to the cemetery grounds. These observations and bits of evidence speak volumes about what the photographer intended and what at least one person on the speakers’ platform understood Bachrach was then seeking to capture when this photograph was exposed. They also corroborate some of the eyewitness accounts and enhance our understanding of what transpired in connection with Lincoln’s “few appropriate remarks.” Maybe by now “seeing” the actual copy of the Gettysburg Address, and Lincoln studying it on the dedication rostrum apparently in an effort to memorize his most recent edits and mentally add the phrase “under God,” we are now another step closer to reaching a consensus over whether the Nicolay copy, folds and all, really is Lincoln’s oration copy. Having given many speeche and toasts myself, even though they were for smaller groups than Lincoln addressed at Gettysburg, I know how before it was time to speak I would review my notes (usually on index cards) and rehearse the pauses and inflections to shape the words. Many like to think of Lincoln’s words as hastily strung together ond almost off the cuff, but at a time when oration was a fine art, Lincoln was a master of it and would have prepared his speech and the delivery of those words very well refining and rehearsing up to the last moment. I’m delivering the Gettysburg address on September 26th (national museum day), thanks for the tip! Marty – Thanks for your feedback and questions. At this time I cannot definitively identity those three men. If you have any theories about their identities, I’d love to hear them. Robert – The man to whom I think you refer was one of W.H. Lamon’s marshals as denoted by his light-colored sash over his right shoulder. 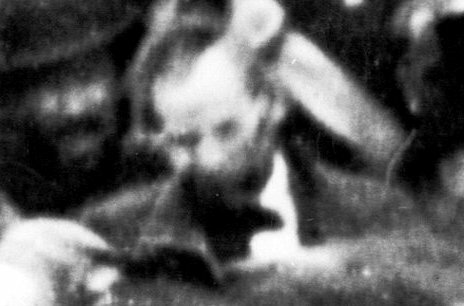 The man whom John Richter has identified as Lincoln in two of the Alexander Gardner stereo views taken on November 19, 1863 on the grounds of the Gettysburg Soldiers’ Cemetery does not appear to be wearing a sash over his right shoulder in either of those views. For that reason, I do not believe them to be the same men.